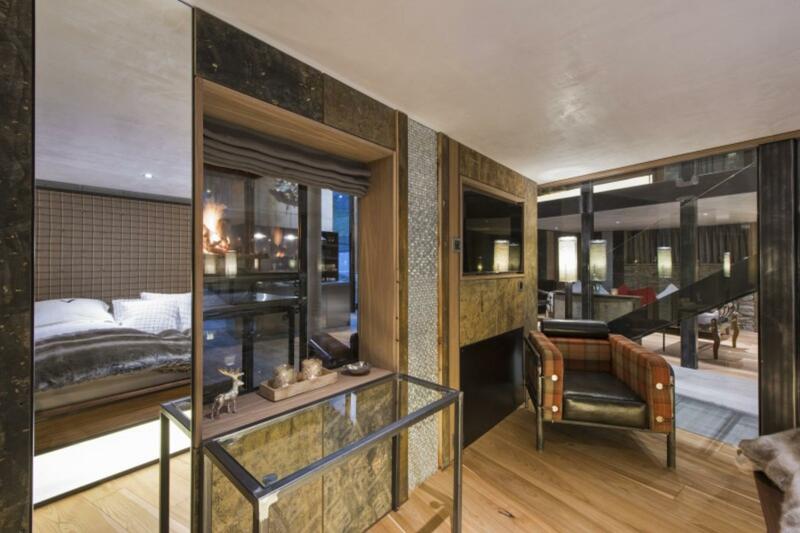 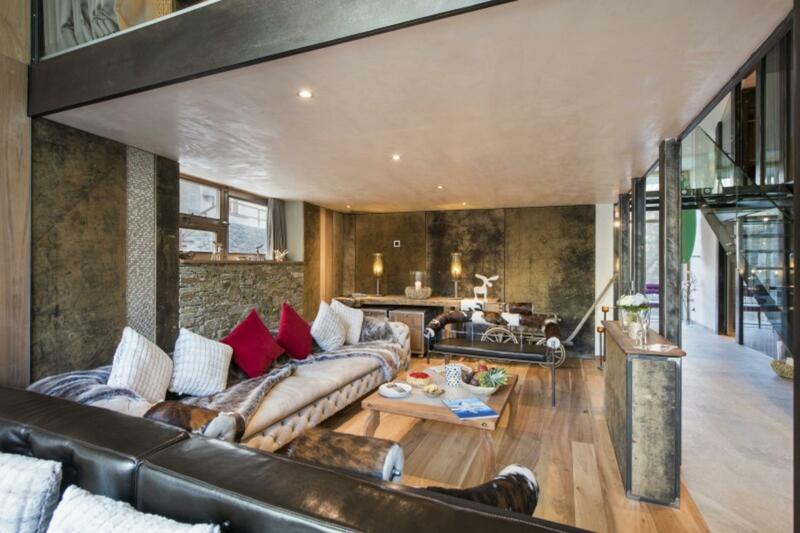 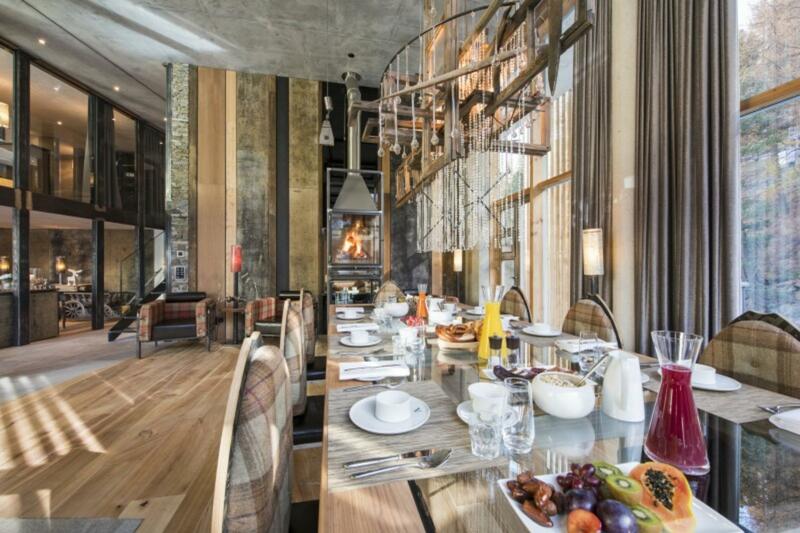 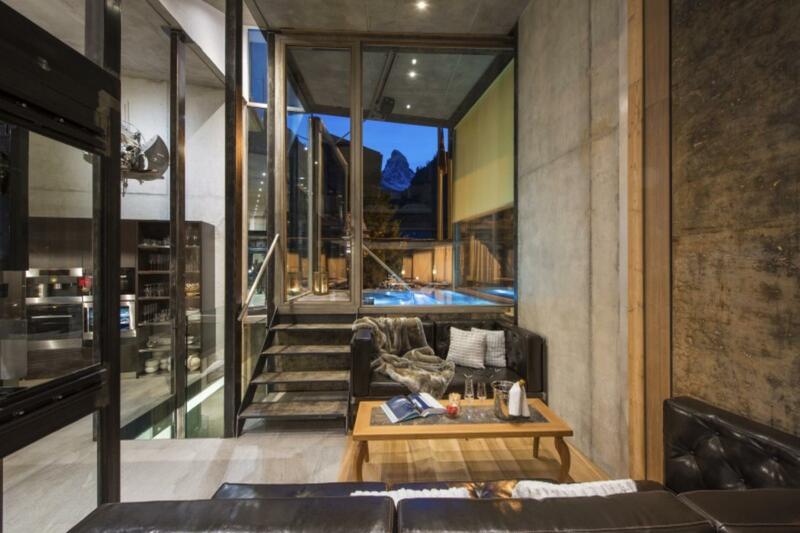 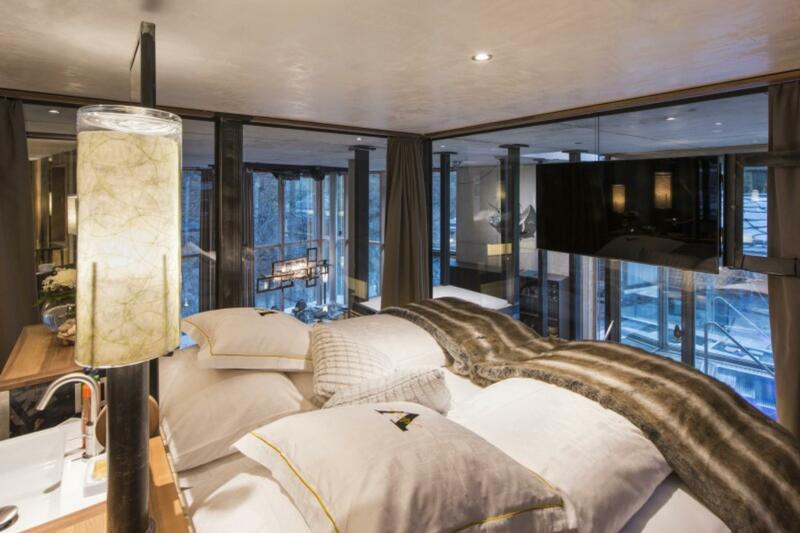 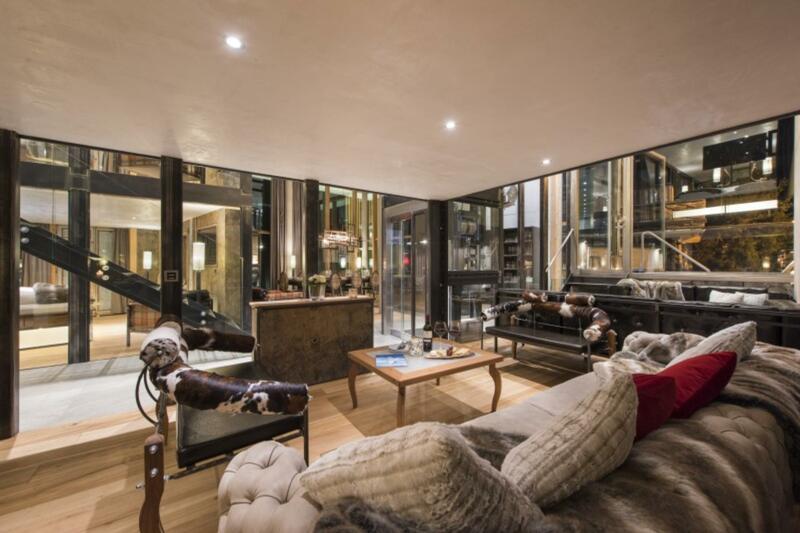 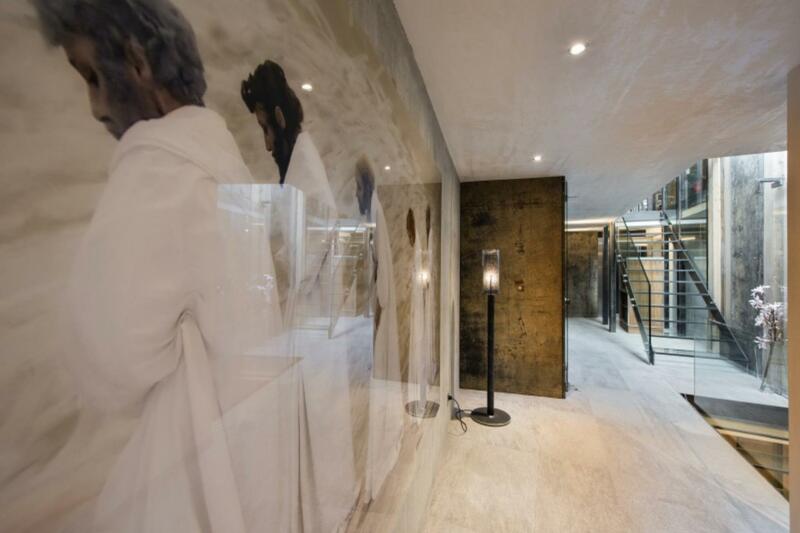 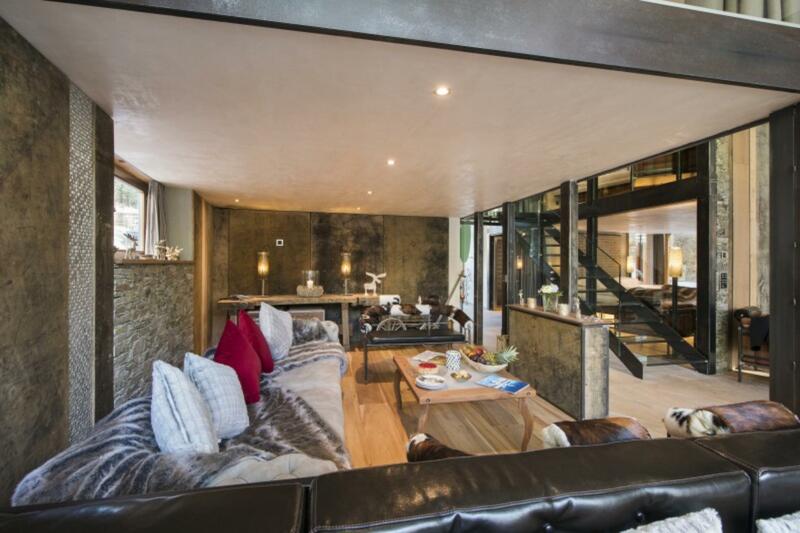 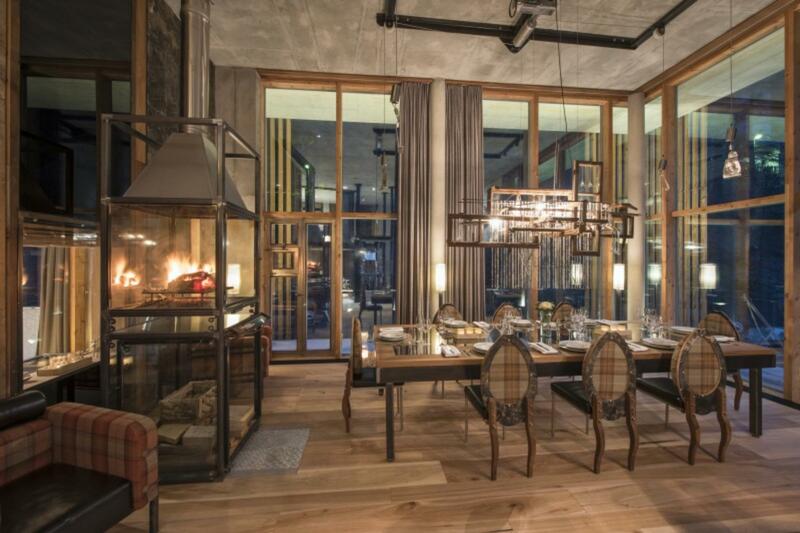 The Backstage Loft is a fabulous contemporary chalet positioned in the heart of Zermatt. 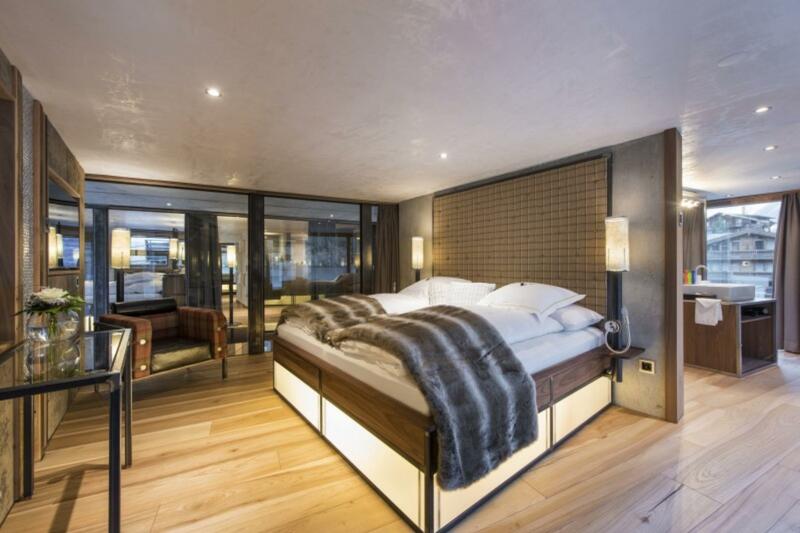 The latest edition in Zermatt's increasing stable of luxury chalets, the property sleeps ten people in five en-suite bedrooms. 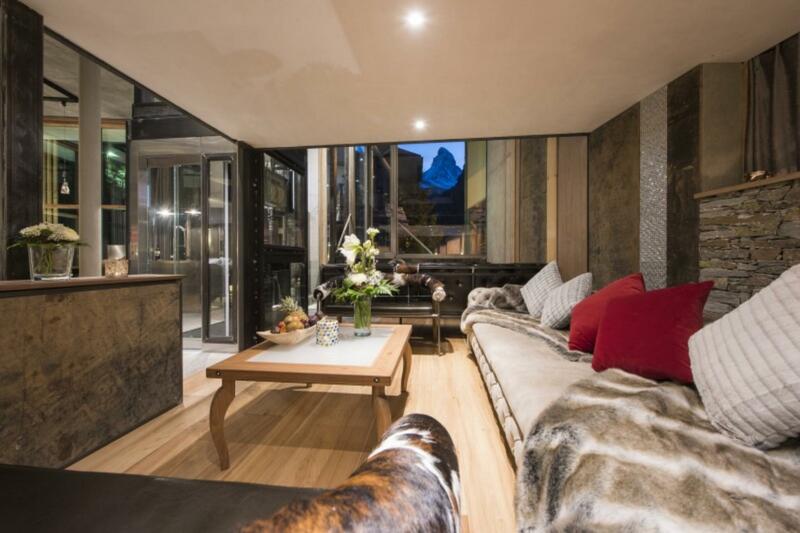 Boasting incredible views of the iconic Matterhorn, the chalet nestles on the edge of the river and is ideally located a short stroll from the main Klein Matterhorn ski lift and the village centre. 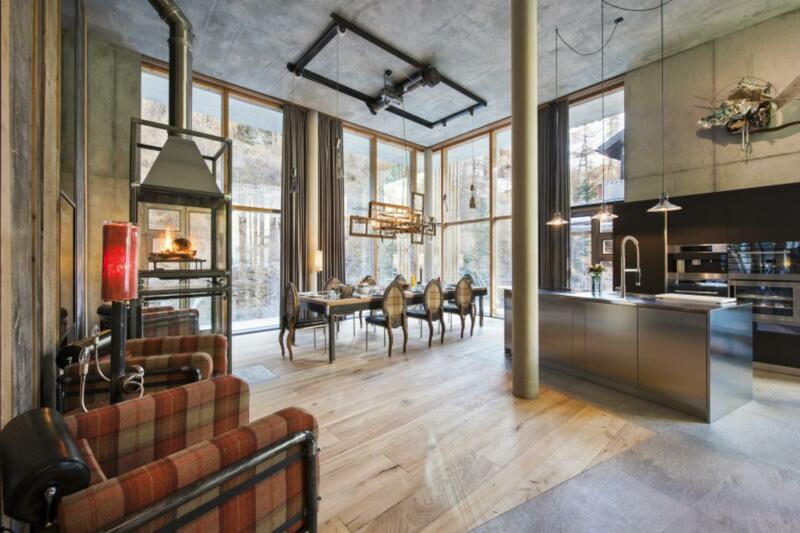 You enter the chalet at street level where steps lead down into the main hallway and cloakroom. 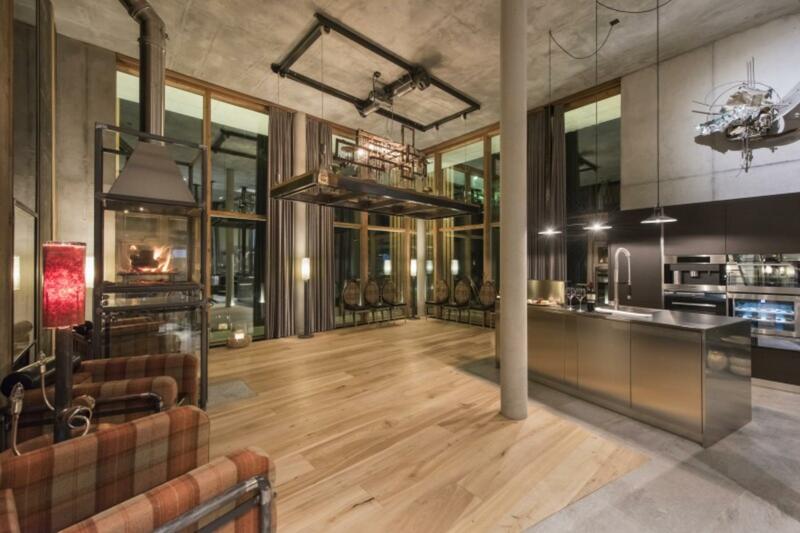 Central to the Backstage Loft is its large, airy, and bright open plan kitchen, living, and dining area located on this floor within the main structure. 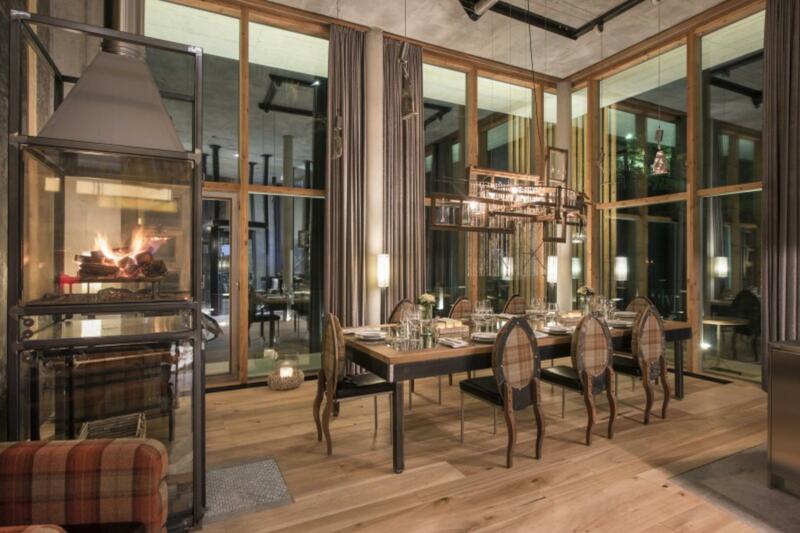 This sophisticated entertaining space features an open wood fire and floor-to-ceiling windows which enhance the chalet's unique architectural style and charm. 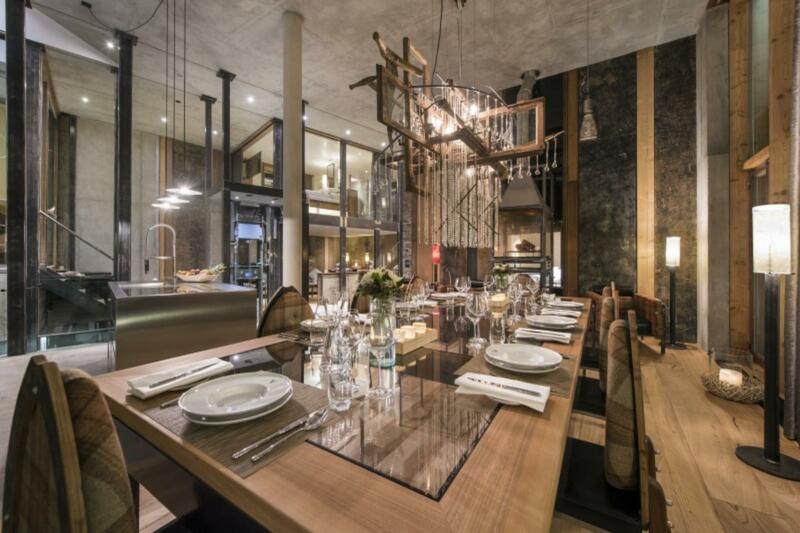 The dining table can be winched to the ceiling, leaving a great floor space for pre-dinner drinks and canapes or for dancing. 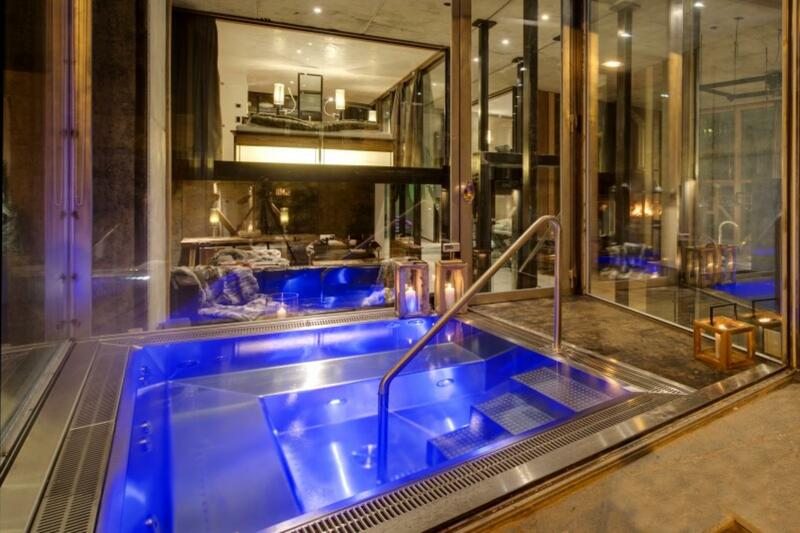 The impressive hot tub is located at the side of the main living room, encased in glass thereby affording spectacular back-drops to fill your senses. 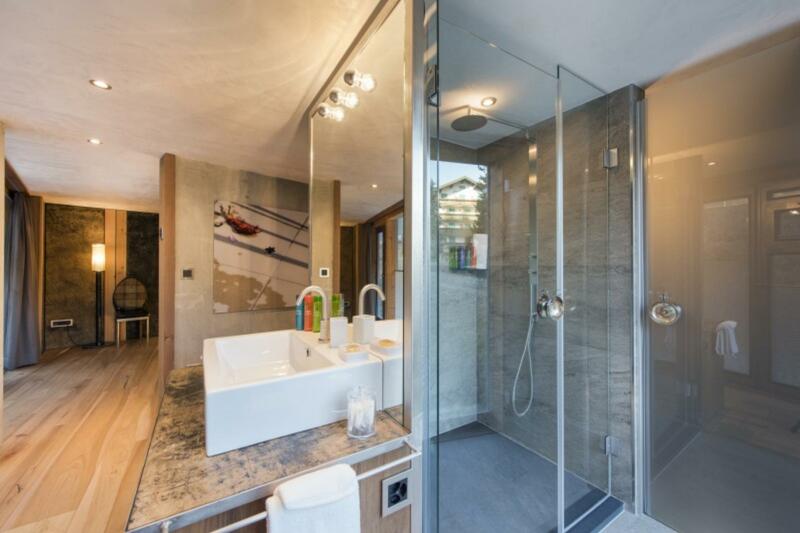 If this isn't enough, with just the touch of a button, the glass wall swings open and the indoor hot tub is magically transformed into an outdoor one. 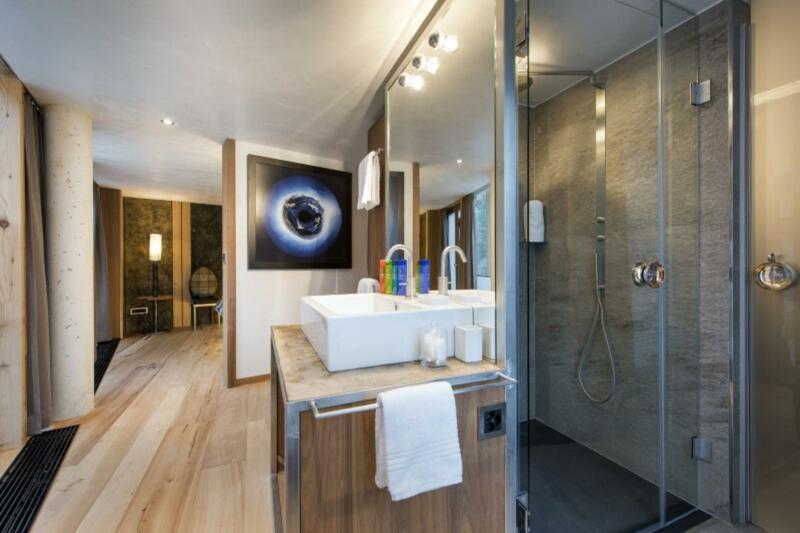 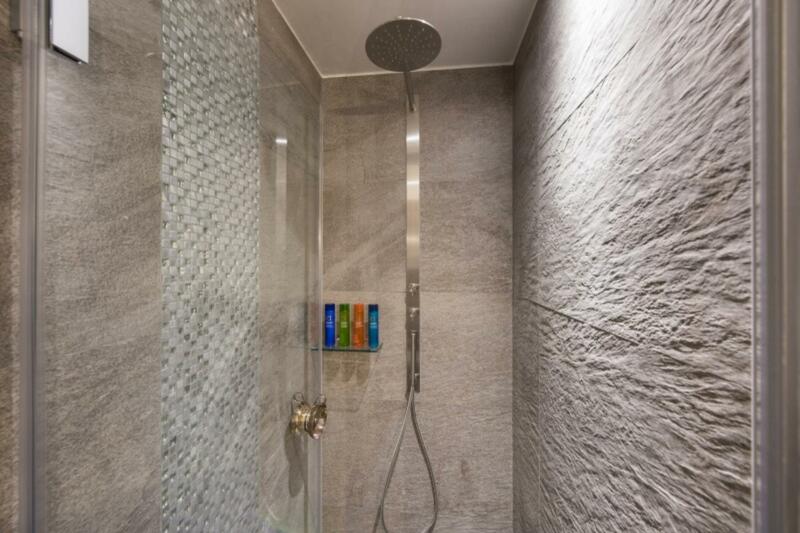 On the entrance level, there is one twin/double bedroom with en-suite shower room, accessed from the main hallway. 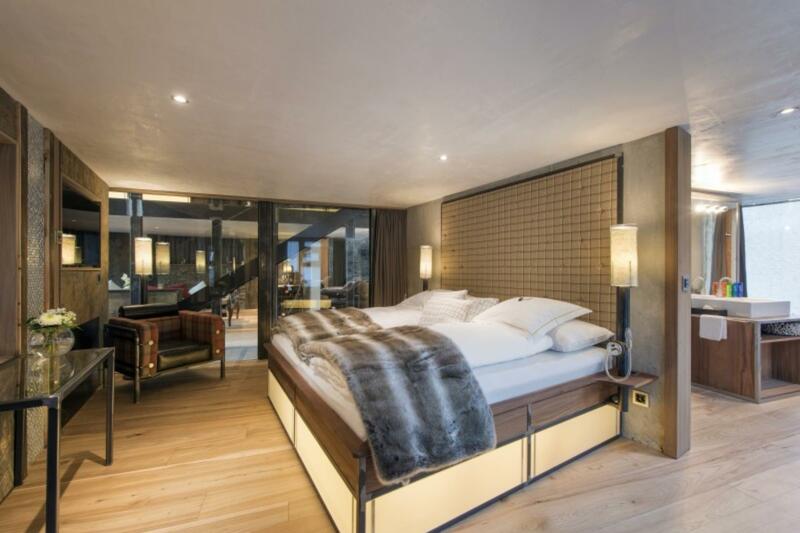 This bedroom opens onto the wrap-around balcony. 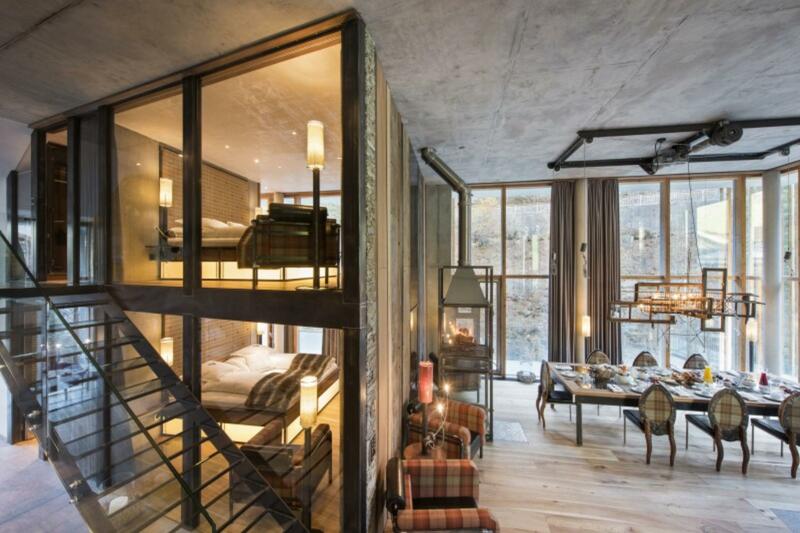 It has a television and safe as is the case for all the bedrooms. 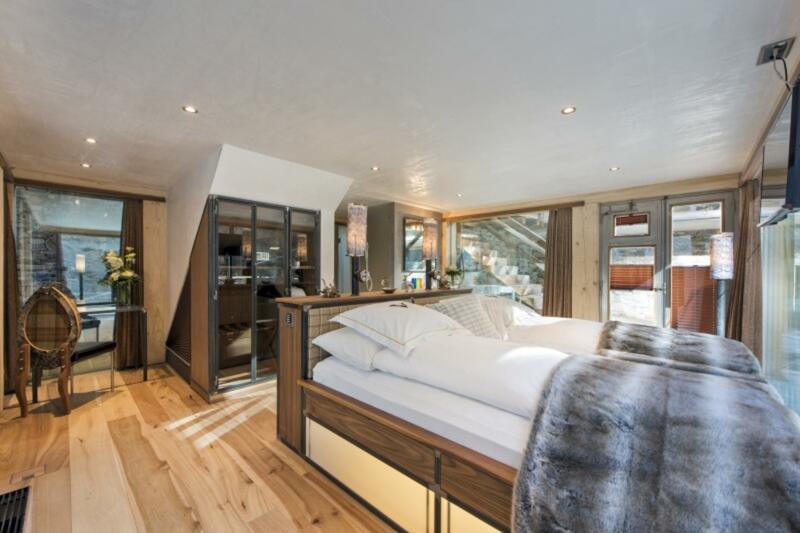 Stairs lead to two further stylish bedrooms, with en-suite shower rooms, located on the top floor of the chalet. 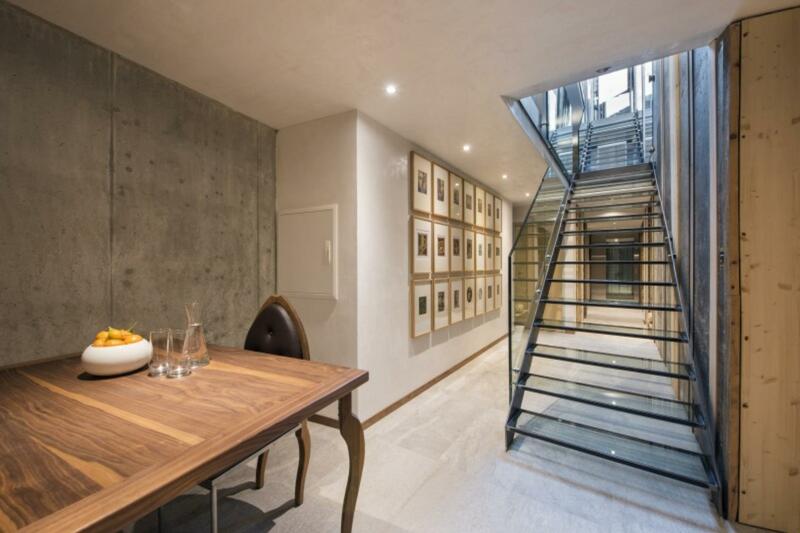 Down the stairs from the living space is located a further bedroom with en-suite shower room, balcony, and separate entrance to the lower street level. 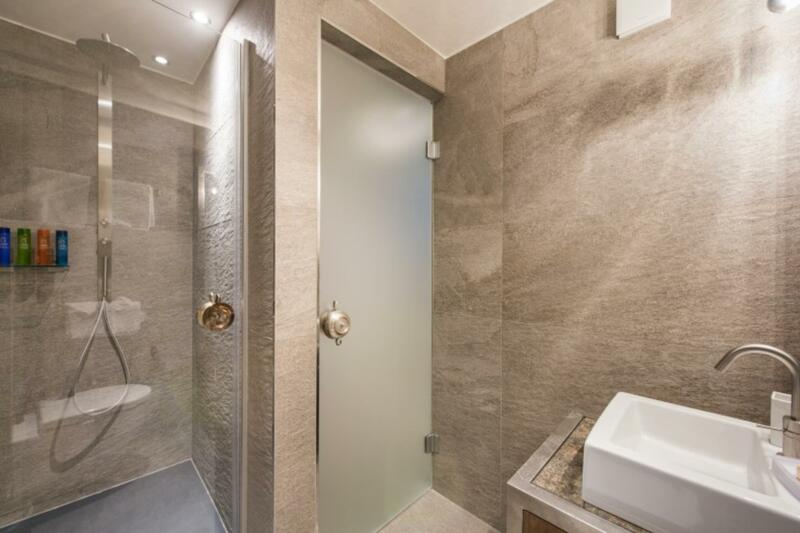 A guest toilet as well as a small hammam and sauna are also located on this floor. 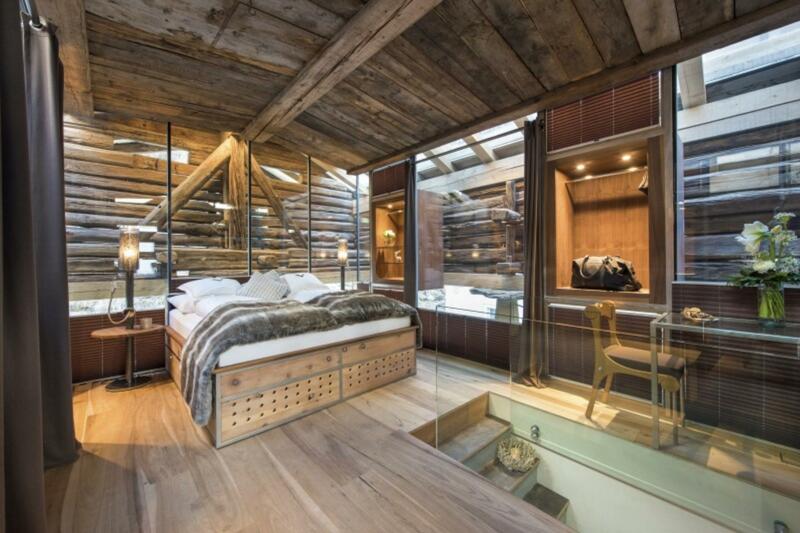 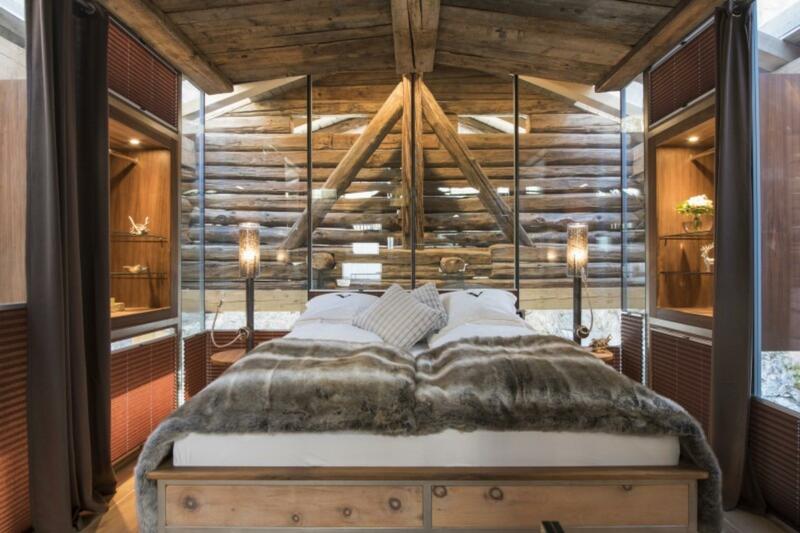 Stairs lead up to the fifth master bedroom with separate shower room, which are located in the adjoining glass-encased converted 700-year-old chalet, the design of which showcases its original wooden beams. 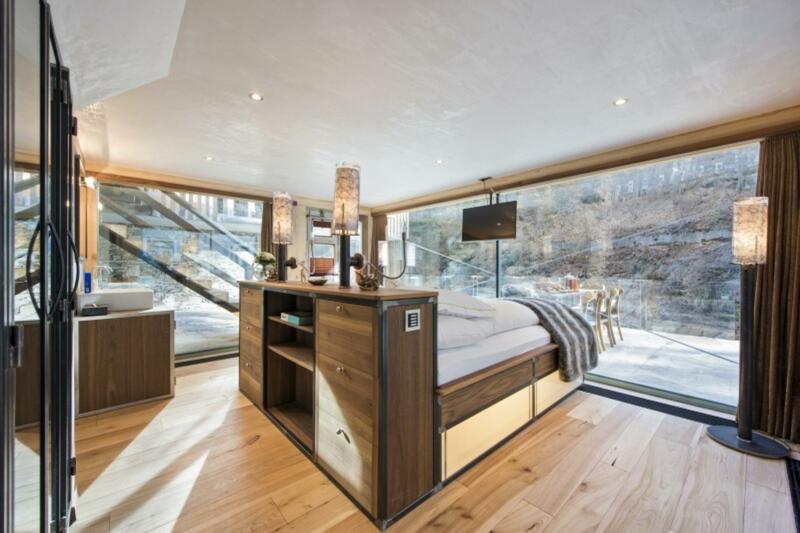 This bedroom has direct access to the terrace and hot tub area outside of the living room. 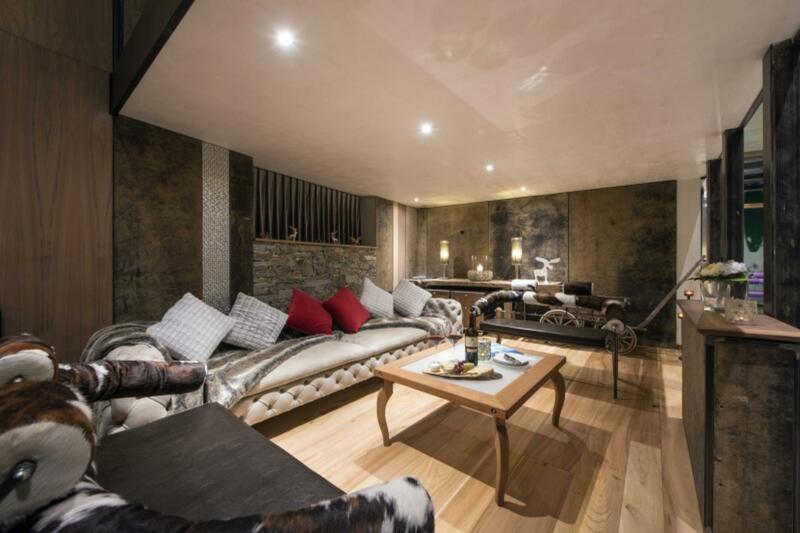 After an exhilarating day on the slopes, guests can take in the latest movie in the chalet's dedicated TV room located on the lower floor of the chalet. 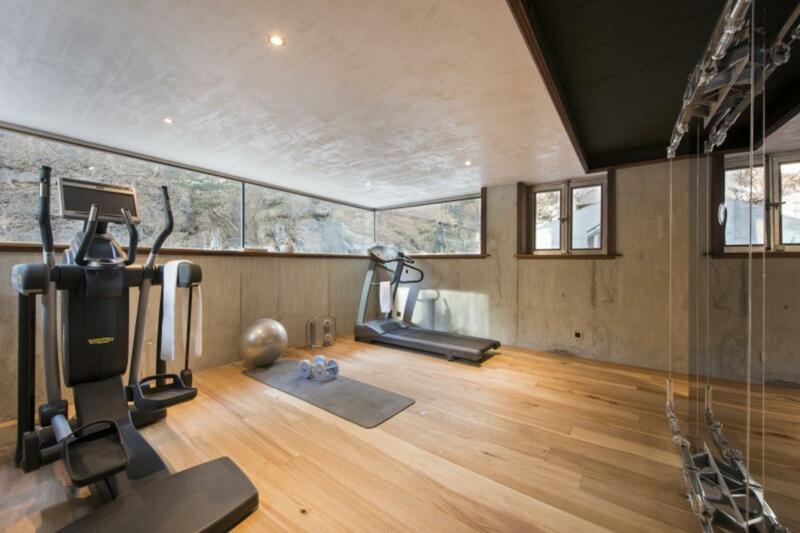 This area also has a kitchenette and separate shower room and access through to the gym, equipped with a treadmill, a cross trainer and a weights installation with views over the river. 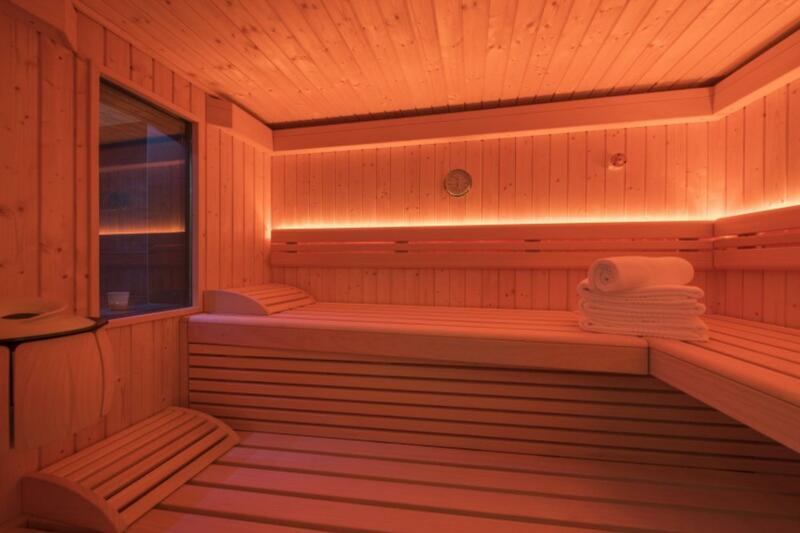 The ski room is equipped with an ample number of innovative heated drying cupboards. 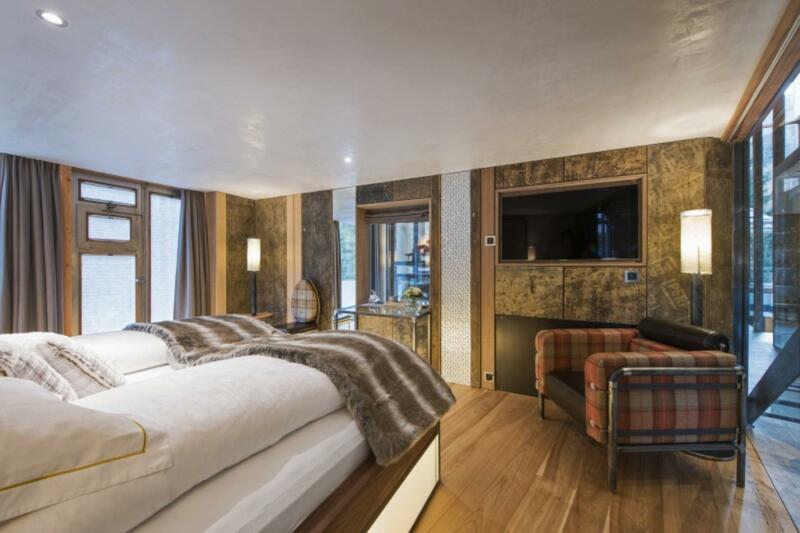 The Backstage Loft is a one-off masterpiece, fusing the historic wooden architecture of the ancient adjoining chalet with the contemporary flair of the main chalet. 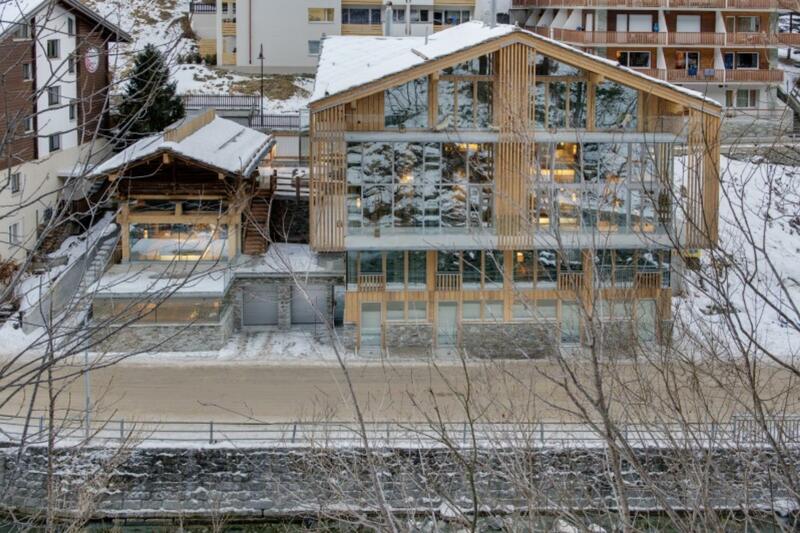 To complement the overall design of the building, Heinz Julen has custom-made every fitting and piece of furniture in his own design studio and workshop located in the village. 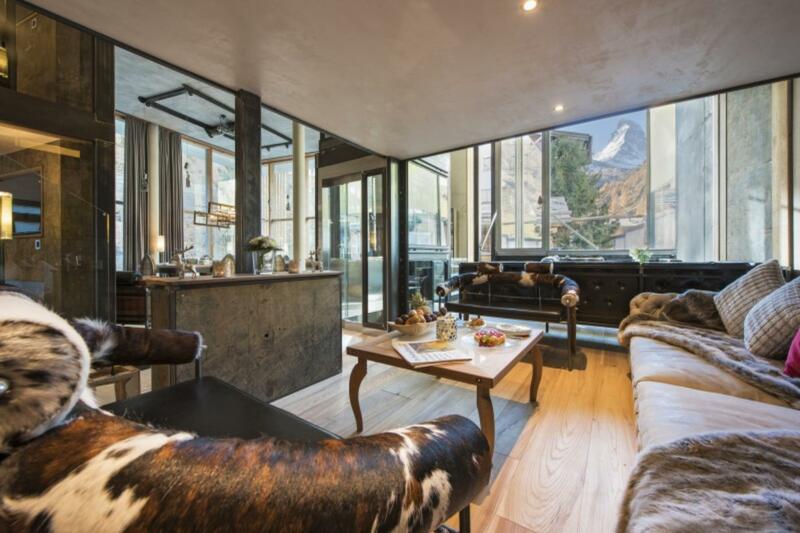 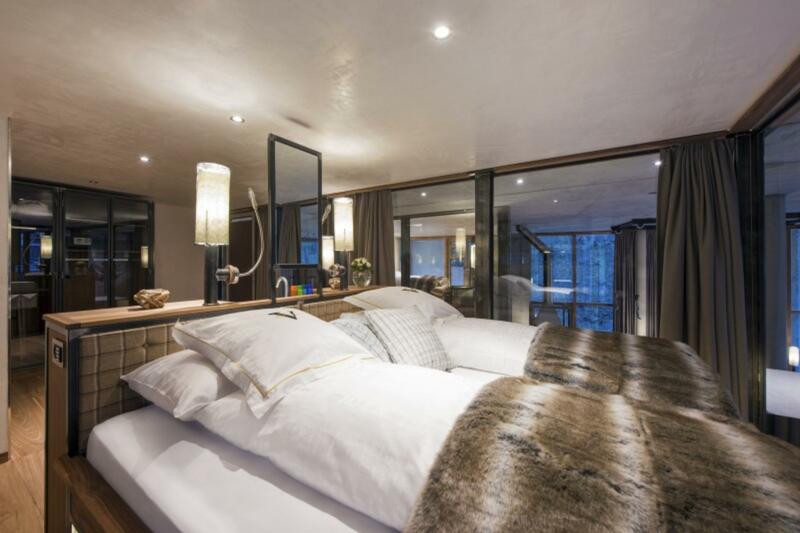 This property truly is a jewel in Zermatt's luxury chalet offerings and our experienced team will ensure that your stay is as memorable as the chalet itself. 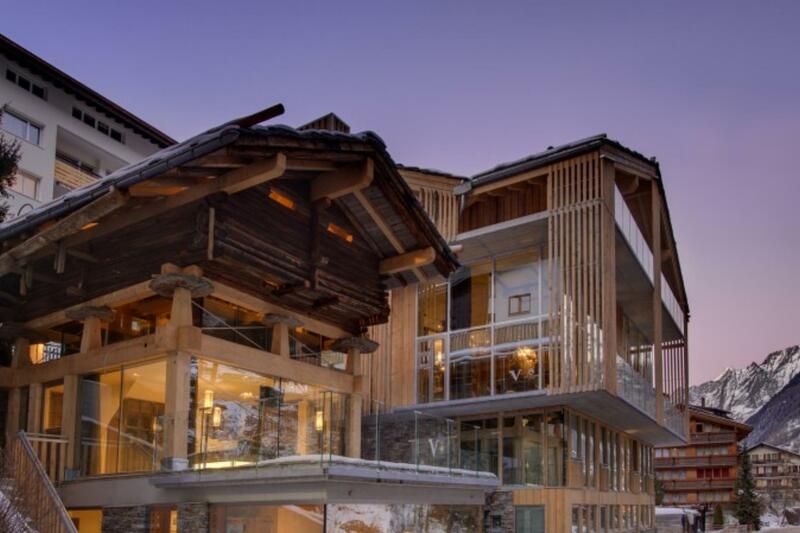 This chalet is sold on a catered or self-catered basis.